Moules Frites , a photo by French Tart on Flickr. Well, Mr Colman’s Mustard did not make an appearance in the end today ~ he will soon though, as we all decided to indulge in French style fish and chips, aka Moules Frites! They were absolutely delicious, small and sweet and just flavoured with a little wine, shallots and fresh herbs. Served with thin crispy chips (frites) and a glass of rose wine, as well as crusty bread to mop the juices up with ~ what could be better for Seafood Friday. Moules are NOT hard to cook at home and I have a step-by-step photo tutorial that I will post here later of how I prepared and cooked these ~ it is very easy I can assure you! 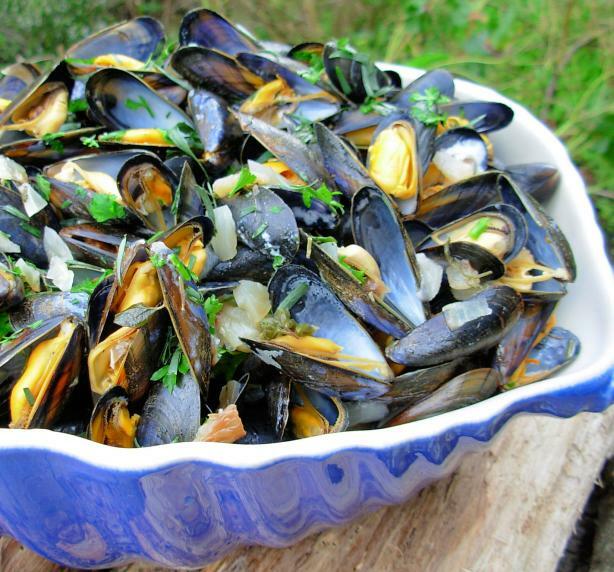 I adore moules, mussels, and this is the classic French recipe for them. Moules Marinières is also commonly known as Sailor’s mussels or Mariner’s mussels. The dish consists of delicately steamed fresh mussels in a white wine, garlic, parsley, butter, onion and cream sauce. Moules Marinières can be served as an appetising starter or even a light main meal. It is delicious served with fresh crusty bread or with frites (chips/fries). There is nothing more mouth-watering than a huge bowl of artistically presented mussels, yet the fun part is eating them. The best way is to use an empty mussel shell as the “spoon” in which to pick the remaining mussels from their shells and then eat them. It’s a brilliant excuse to use your fingers to eat rather than the usual knife and for – very tactile! A traditional French recipe will use butter, however the butter may be substituted for a few tablespoons of olive oil for a healthier option – I sometimes use a mix of butter and olive oil. Bon Appétit! Place the live mussels in fresh water. Scrub and debeard the mussels (see the photos), discarding any that are open, broken or cracked. Fry the chopped onion and chopped garlic cloves (over medium heat) in a little butter (or oil) in the biggest saucepan you have. Add half of the finely chopped fresh herbs – I have used a mixture of parsley, oregano and tarragon. Season with black pepper, wait to season with salt to taste later. Add the white wine to the butter and herbs, and then tip in the freshly cleaned mussels – turn up the heat to high. Cover the pan and let the mussels steam for about 5 minutes. Shake the pan every minute or so to coat the mussels in the liquid. Take the pan off the heat and add the double cream or creme fraiche; then add of the remaining finely chopped herbs. Mix through thoroughly. That’s it! Enjoy with crusty bread, frites and a chilled white wine — divine!